SnO2-Ag composites are widely used as contact materials in low-voltage instruments. Commercial composites are made by powder sintering and show a random network of the SnO2 and Ag phases. The composite architecture greatly affect arc erosion behaviour, contact resistance, and anti-welding ability. Here, we use extrusion 3D-printing to fabricate, and then sinter, regular 0/90º SnO2 scaffolds whose open porosity is then melt-infiltrated with silver. The regular SnO2 phase architecture in the composite is expected to improve arc erosion resistance because the SnO2 scaffold will impede the flow and splashing of molten silver during arcing. Meanwhile, the continuous silver matrix channels conducts current effectively, and is expected to achieve a lower contact resistance than commercial products where Ag shows a tortuous morphology. We study here the densification mechanism of the SnO2 scaffolds during sintering, the infiltration behaviour of liquid silver, and the properties of the composites. Figure 1. 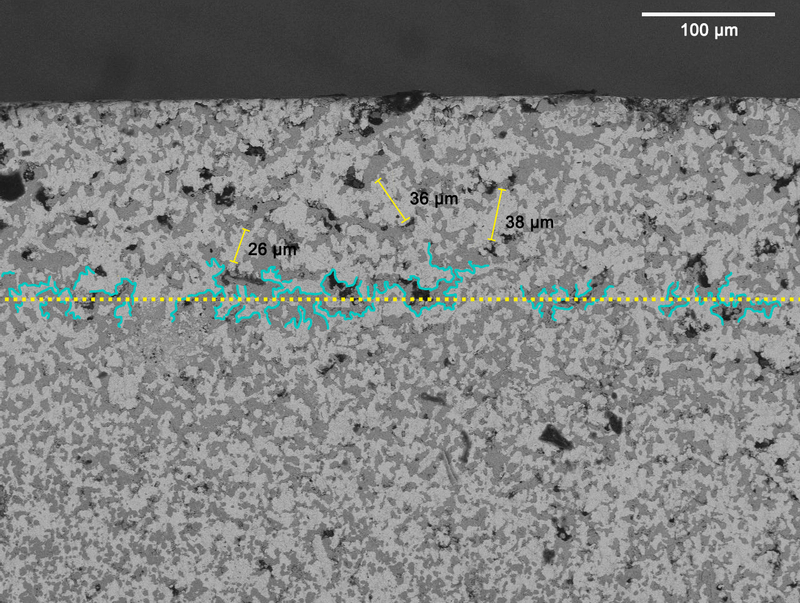 SEM image showing tortuous SnO2 (dark phase) and Ag (light phase) architecture after 10,000 arcs with near-surface layer showing some phase coarsening.